The Global Volcanism Program has no activity reports for Hodson. The Global Volcanism Program has no Weekly Reports available for Hodson. The Global Volcanism Program has no Bulletin Reports available for Hodson. 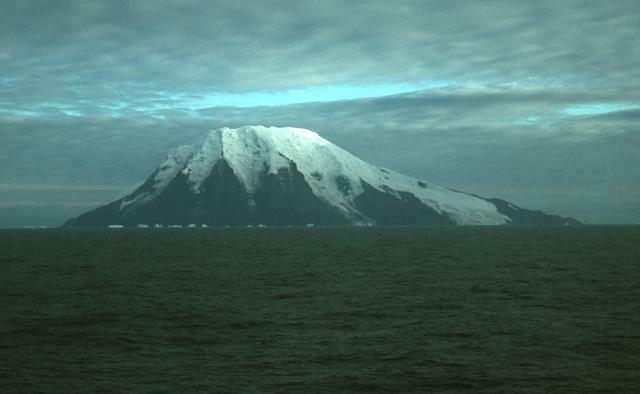 The largely ice-covered, 6 x 8 km Visokoi Island consists of a single stratovolcano, Mount Hodson, whose rounded summit lies west of the center of the island. Numerous basaltic scoria cones were constructed on the lower flanks of the oval-shaped island, which is part of the Traverse Islands in the northern part of the South Sandwich Island chain. The youthful morphology suggests that volcanic activity has continued until virtually the present time (LeMasurier and Thomson, 1990). Possible eruptive activity was reported during 1830 and 1930, and the summit is usually obscured by "smoke" or steam. There is no Deformation History data available for Hodson. There is no Emissions History data available for Hodson. Glaciers descend the steep southern face of Visokoi Island from the flat-topped summit of 1005-m-high Mount Hodson. Wordie Point (left) and Irving Point (right) lie respectively at the west and east sides of the 6 x 8 km wide island. Numerous basaltic scoria cones were constructed on the lower flanks of the island, which is part of the Traverse Islands in the northern part of the South Sandwich Island chain. Possible eruptive activity was reported during 1830 and 1930, and the summit is often obscured by "smoke" or steam. Photo by John Smellie (British Antarctic Survey). The Global Volcanism Program has no maps available for Hodson. There are no samples for Hodson in the Smithsonian's NMNH Department of Mineral Sciences Rock and Ore collection. Large Eruptions of Hodson Information about large Quaternary eruptions (VEI >= 4) is cataloged in the Large Magnitude Explosive Volcanic Eruptions (LaMEVE) database of the Volcano Global Risk Identification and Analysis Project (VOGRIPA).